"I heard that, and I am going to repeat it when Parson's over." Talking birds can entertain you and everyone within earshot -- and they can embarrass you, too. Sometimes words they take to most readily are those we regret they ever heard us utter. What you say around them matters. Heed the saying about being so discreet you could sell the family parrot. 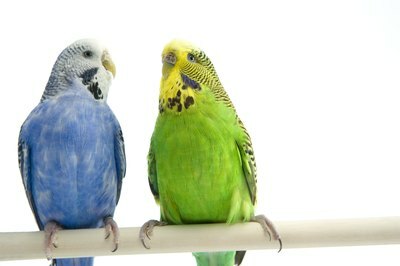 Murmur dulcet-toned love phrases to a budgie over and over to teach him to say phrases. Things like "Ooh, pretty," and "Hey there, gorgeous" might work, but be careful. You might not appreciate it when he climbs silently down the drapes to croon into the ear of the vacuum cleaner salesman, "Whatcha doin', big boy?" It's much safer to stick to a cheery "Hello" or "Hiya." An advanced talker could learn a real conversation starter with something like, "I can talk. Can you fly?" Birds learn words more quickly when they get a reward for saying them. Many can learn to request a specific food treat, such as "apple," "grape" or "banana," but the hackneyed "Polly wanna cracker?" has lost its appeal. Bath time is also a bird treat and can be a motivator for talking; teaching a phrase like "get wet" would let him clue you in to what he wants. In addition to words, birds learn to mimic sounds they hear frequently. A small-business owner who keeps a mynah bird on the front counter will likely begin to hear an addition to the bird's vocabulary: the bird-generated sound of the telephone ringing, followed by the professional greeting, "Town & Country Pet Shop." Even wild birds can learn to talk, taught by escaped pets -- witness the zookeeper who opened a crate marked "Wild Cockatoos, Australia" and peered in to see the flip of a yellow crest and hear, in a broad Strine accent, "'Allo, Cookie!" Pronounce any word you want to teach a bird with exquisite care. Since a bird has no lips, he can have trouble saying the bilabial consonants "p," "b" and "m," as well as the labiodentals "t" and "th." If your enunciation is sloppy, your bird's will be, too. Avoid words with lots of hissing or shh sounds -- birds may interpret these as sounds made by their natural enemies. Be careful of phrases that may quickly become outdated or unpopular. The classic "Pieces of eight!" from Long John Silver's Cap'n Flint may appeal, but if you move from D.C. to Dallas, on game day you may not want your bird to be cheering the Redskins. If you don't want a blue cloud issuing from your bird's cage, don't swear around him. Birds acquire words more quickly when they're said with emphasis or emotion. Unless you own a biker bar, a potty mouth may get him and you in trouble. How Do Parrots Imitate Speech Patterns?